With all the things happening in Japan, I felt very lucky to have already booked a three-week trip to Europe for my girlfriend and me, staying mostly with relatives. Since then, I’ve had a wonderful, eventful holiday, even better than I could have expected… more on that later. Like a lot of people, getting out of town for a bit seemed a sensible thing to do, my only worry being power cuts or an unexpected earthquake interfering with our trip to Narita Airport. With the trains being so intermittent, we booked a convenient airport coach from Kashiwa, which we safely made our way to the airport on on the Saturday morning. With so much booked and ready, it was a relief to get there without a hitch. There was then a series of very long delays getting to London, leading to us spending hours in Narita and Hong Kong airports. The situation being so extraordinary, I didn’t mind so much and British Airlines also gave us some generous food coupons that meant we could get whatever we liked at the places that accepted them. Now I’m here, we are still checking the news in Japan. No major quakes near us appear to have happened and the reactors, though still producing radiation, seem to be far more stablized than when we left, when some kind of sudden explosion was not beyond the realms of imagination or the wilder speculations of the press. Shortages still seem to exist, especially with bottled water and fuel and the coast is not entirely clear. We can only hope that the careful measures to contain the radioactivity pay off. Japan being a small country, they can’t afford to let a large area go to waste the way that happened with Chernobyl and I expect they will reduce the damage as much as possible. Hearing about a Fukushima farmer committing suicide when he heard that his rows of perfect, organic cabbages were no longer sell-able brought home to me the human cost of this drama. The Japanese authorities have a difficult task weighing this along with the dangers of cutting people off from their homes, lives and livelihoods. Different governments have been saying different things, sometimes contradicting earlier attitudes. The French government, for example, recommended leaving all but Southern Japan, yet when actual radioactive fallout fell on their produce from Chernobyl (obviously, a much worse accident), unlike neighbouring Italy they declared an all-clear and refused to ban any sales, saying that any radiation had miraculously ‘stopped at the Italian border’. So we who have deep connections in Japan have to be aware of the political motivations behind foreign government’s advice, mainly aimed at their own non-essential citizens who might otherwise get in trouble and often involving some grandstanding of their own, to decide for ourselves how cautious we feel we need to be. To me the US/UK recommendation of 80km makes a lot of sense, weighing on the side of caution without being too over the top. Not being an expert, I can’t give any advice (and the current fashion for people who know a little bit to be trying to seems a bit mistaken), but there seems to be a consensus that, especially for adults, very low levels of exposure are safe. Perhaps we should be more worried about pesticides and other pollutants, I don’t really know. It’s certainly something we need to decide for ourselves about, if only for peace of mind. I project that just as before, the real problems will be nearer to the events, further afield being psychological fear, which has a power of it’s own. I hope and pray that the effects will turn out to be very mild, which is what the plant was designed for. As for precautions, when I go back I expect I’ll be more careful about wind and ‘acid rain’ coming from that direction for some time to come. I expect farmers downwind of it will have periods when their produce is deemed unacceptable, fairly or not. But living far away from the source in Chiba-Ken, I’ll be carrying on with my life as normal as much as possible. Thankfully, in a series of heroic actions, the early chance of a spectacular meltdown billowing into the air has been so reduced as to be practically impossible (if in fact it ever was, I tend to think that it couldn’t be ruled out as we never know for sure). There is always the chance of a big Kanto earthquake, but that’s nothing new, in fact the one that happened could just as well been in Kanto. I’d really understand people not going there or not going back and also the fact that people will worry about me being there. I appreciate the concern, yet however worrying it is, the risks where I am are so low and the good things about carrying on living there are so many, that I am going to go back. My students will really appreciate having my class. Please remember that when it talks of what could happen, the media is generally sensationalistic, which is the only way of getting people’s attention. Hopefully things keep returning to normal, the power and trains get stablised as they bring online more power plants. Just being alive remains a miracle. I intend to keep enjoying it, whilst doing what I can to help others, which includes cheering them up. I actually think this is a great thing we can do for our students, who even if they haven’t been directly affected, may still have been worried by things. Seeing how well people have co-operated, kept calm and looked after one another is really moving to see. Now that I have the things I need over the next few days, it is a strange period here. Suddenly, Japan seems to be as fixated on the dangers posed by the stricken nuclear plants as the rest of the world. Just about everyone I know spent this evening inside, with their place closed up. no, we aren’t in the ’emergency zone’. Just some low-level radiation managed to drift towards the Tokyo Area from a plume of smoke from a fire at the number 4 reactor. The dangers it poses are apparently (at least with limited exposure) negligible, but on the advice of the French authorities, who are seen as being more cautious and also more candid than the ones here, people didn’t want to take any chances. Despite my scientific scepticism, neither did I. I wonder how much of it is coming from anti-nuclear sentiment and how much is based on facts, but there is a growing fear of what could unfold. At any rate, knowing everyone is inside has led to a strange sense of community- conversations that would otherwise be in a coffee shop are had over a phone, or by computer messages. Perhaps it’s just today, but I foresee much more of this taking place, especially if more places close, because less people try to go to them, because more places are closed… and so on. Whenever ordinary life does return, perhaps as soon as a week or two, perhaps longer, it will inevitably be influenced by this strange period. Panic buying has made toilet paper and bottled water no longer the cheap items you unthinkingly get, but hot commodities. apparently, on Amazon, alcaline batteries are available for the princely sum of 16,000 yen… quite a hike from their 100 yen price just a few days ago. Under them was a thread of angry comments about the attempt to profiteer, but ultimately it was a shocking example of the law of supply and demand. It meant my cheap batteries I bought just in case I need them are worth more than some of my camera lenses. Quite a change! in case there’s anyone who doesn’t know, repeated hydrogen explosions and a brief fire have afflicted the seemingly well-designed Fukushima Dai-Ichi Nuclear Plant, raising the spectre of a ‘melt-down’. The results of that no-one really knows for sure, though the hope is that it would only be local. Yet locally, even it would seem to be a catastrophe of it’s own. The radiation levels there are sky-rocketing and the advice given to people nearby, many of whom can’t evacuate because of lack of fuel to travel with, is so restrictive that one wonders if it is even possible to follow. Not leaving one’s place means an impossibility of getting fresh supplies, with no-one coming to deliver new ones. I suppose in time the levels could go down, but the question is, can people hold out until then? Just imagining people being stuck out there with no-where to go is terrible to think of, though there seem to be plans to evacuate them as soon as possible. It would be worse than the Tsunami in a certain way, as you wouldn’t be wither saved or dead, you would be somewhere in between, not knowing what would come next. I can’t help but feel for and admire the people who are probably sacrificing their lives by staying in the reactors, doing whatever they can to prevent them exploding. Many factors led to them being built out there. Ironically, a major one was the anti-nuclear movement galvanising opposition so that only the most poor and remote towns would agree to their construction. no all very understandable, you might think, but when you see that this led to them being built in an area unusually prone to Earthquakes and Tsunami, you have to wonder if a better solution than always caving in to popularism could be found. In the case of Japan (and probably France), nuclear power is a strategic necessity, Japan simply couldn’t afford to meet all it’s energy needs through using oil. Not to mention the memories of the ‘oil shock’ of the Seventies, in which it became less obtainable due to Middle-Eastern boycotts. Anyway, seeing them devote their time and their lives to these last-ditch efforts, which may well not succeed at this point, but should at least mitigate the damage, is moving to consider. In case anyone is wondering, the levels far away, such as here can’t be and will never be comparable, simply because of the dilution of the radioactive material. I could envision a dangerously toxic plume, I just knew one would develop, but it isn’t comparable with the very light remainder of it that made it to Tokyo. The very fact that the plants powered off means that the potential disaster is nowhere near Chernobyl. Yet in the short term, even a smaller risk is an unacceptable one for many people, so wind patterns and what actually happens at the stricken site will make a difference to their behaviour. I just hope this period is very short term, as I wonder if the local economy could handle people staying in all the time. Here, other issues are more prevalent, such as panic buying, the shortage of petrol or Toyu heating oil and the cuts to train services which keep people from going to work (which in turn reduces their electricity usage). Of course in all of this, I talk as though I know a lot more about the situation and factors involved than I actually do. From sheer necessity, I did online research to get a perspective that seems to me, at least. to be reasonably realistic. I feel that like so many things in my life, this is a distraction from my ultimate purpose, yet at least, I suppose, it is a different distraction with different lessons to be learnt. I actually think it would be better (if we could), if we spent more time reflecting on the immense relief effort taking place to rescue Tsunami survivors, or even more so, learning from their experiences. I heard stories of people going unconscious and then feeling something hit them in the back, prompting them to grab onto an antenna or signpost, which turned out to save their live; even better, with the black-out, their body went into an automatic mode. One of Yuko’s neighbours told of their son’s wife, a nurse, stumbling into his house days after it hit, covered in mud yet unable to remember of anything that happened, let alone how she managed to make the long journey home. These are dramatic stories, with very important messages of just what it means to be a human being on this planet, pulling through by a hair, though seemingly in the grip of a higher power, sometimes one activated through some kind of unconscious trance. They are stories worth looking into. They bring meaning to what would otherwise be a rude invasion of chaos into our ordinary lives. This is just a quick post about what it’s been like for me being here over the past couple of days. Being use to a ‘normal’ life, the spectre of so much potential danger hanging over me is leading to a surreal quality to everything. I have to stress the word potential, as of course, everything could turn out to be alright and of course, I hope that’s the case. Yesterday, I met Yuko in Otakanomori for shopping and lunch. The trains were running fine, though there were less people around than you would expect. It was strange to see the whole shopping center closed, presumably to save electricity, with all it’s lights and heating needs requiring just too much. Some other shops and restaurants were open though and we had a nice lunch there. I felt strange eating out when there are so many disasters going on in Japan, but what are you going to do? They are still running a restaurant, depending on customers to do so and they need our support to keep going. We were planning to get a new small, portable computer for our trip, so as to travel lighter and have something that has a longer battery life than most laptops. So it being a mere 25 minutes away by the Tsukuba Express to get there and, not really knowing hen we would be in such a good position to do so, we decided to head on down there. The atmosphere there was just like any Sunday. There may have been a few less people, but it was active and bustling, many shops open and girls dressed in maid costumes enticing in customers. Going there with Yuko was a very different experience, as the staff really wanted to explain to her the pros and cons of each computer. We went around, trying different models, generally wanting the lightness and battery life of a netbook, but not it’s limitations. In the end, we went for a lovely Toshiba CULV (consumer ultra-low voltage, power-efficient) 11.6-inch dual-core ultra-portable, that seemed to be the best compromise, whilst still ensuring the use of full Windows 7 functions, with it’s HD screen. Whilst the atmosphere was fun and dynamic as ever. there were a few more strange-feeling anomalies. Yodobashi Camera had all it’s usually vivid neon lights turned off. In fact. the only way to see it was open was the window-lights and a scrolling message around it saying something along the lines of “don’t worry, we’re open, we have just turned off our neon to save electricity”. We got onto the wonderful, comfortable Tskuba Express and headed home, happy we had taken the chance to go down there. Back in the suburbs, the sense of impending doom returned. 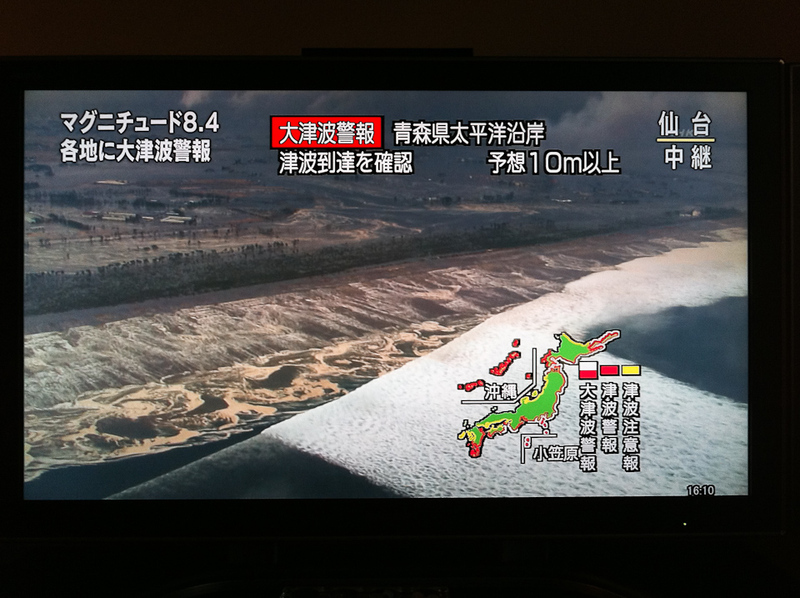 turning on the TV, there was more news about the stricken reactors in Fukushima, with reassurances that the emitted radiation was low-level, but no possible guarantee that it would always stay that way. Aftershocks rocked the apartment and news came in that there is a 70% possibility of a level 7 aftershock in the next 3 days, after which it would drop to 50% and keep receding. I added elements to my ’emergency bag’, kept by the door at all times, with some more warm clothes and another charged iPhone battery. Today, we were able to use the car to get some more supplies. The local train line (Tobu-Noda) was stopped, again to save power, not just on the train but on the massive usage offices have. Luckily, my neighbourhood has an almost fully-stocked Belx, where I could get fruit, vegetables, bottled drinks and others. Yet there was no more bread or mineral water, or milk. The place was due to close at 2:00, before a projected 2-hour power-cut. Nearby was a Matsumoto Kyoshi. For some reason they had canned goods still, but no tissues, the entire row was wiped clean, though as I already have plenty, I just got some wet-wipes. We got some other practical necessities from the 100 yen shop- a small bucket, for using bath water to flush number-2’s during a power-cut in the event the water stopped flowing as it was dependant on pumps (which makes for excellent water-pressure, providing the electricity is around). One disturbing thing was the fact that all the petrol stations we passed were closed and they had run out of Toyu heating gas. Neither were ‘gas bombe’, canisters of gas for small stoves available. Apparently they had been the first thing to sell out and the shop owners had no idea when they’d get them again. If gas and electricity became cut off, as has happened in other areas, options for heating food would become very limited. Coming home, we made some arrangements. We filled the bath with water in case it was needed during an outage. We also made some tea, kept in a thermos, with another larger thermos holding hot water. I made sure I had a bunch of torches ready and my laptops and phones were topped up. You see, with the outage, you might not know for sure if it would come on again when you were expecting it and these devices are essential, not just for amusement but for communication (though without internet or phone lines, I would be in the dark for a bit). I unlocked a convenient door, in the case that it would be needed in a sudden quake- not something I would expect, but under the circumstances be prepared for. Then came my favourite touch, a ring of motion-sensing LED lights spread around the apartment. put into always-on mode, so I wouldn’t have the spookiness or possibility of accident of total darkness (something that nearby street lighting meant I never usually had). We watched the TV, seeing ever-changing projected times for the power-cut, which in the end was deemed unnecessary in our area due to power savings from not using some train lines and less people going to work. It was an anti-climax I was very pleased to hear of, not only for me, but for places like small hospitals or mothers with small kids to feed, who might not be fully prepared, or even aware of what to expect. Having power let me do Skyping, Facebook and so on and exposed me to more news. It seems that foreign companies aren’t satisfied with the official reassurances of the Japanese government regarding their reactor’s radiation leakages, not only the current venting of steam, but the potential of much worse radioactive fallout being emitted, that could travel very quickly by wind to the Tokyo area. It seems that the sheer power of nature defied the well-researched designs of the plants, faced with one of the largest Earthquakes on record, as well as colossal Tsunami. Cooling down afterwards seems to be a real problem, with having the energy onhand to keep pumping seawater over them, with the failure of their own coolers taking place repeatedly, seems to be a real challenge. Although I accept the official statements that what has been emitted so far is not too dangerous, at least from a large distance, that isn’t to say that a serious meltdown could be relied upon not to release a ‘toxic plume’, that might head inland rather than out to sea. Reading on the internet, the opinion of experts seems to be a bit divided, although they seem pretty unanimous that since the reactors have automatically shut down, their level of heat and radioactivity is nothing like that emitted by Chernobyl. New news that two rods became exposed in the second reactor is not exactly reassuring. I really take my hat off to all the brave TEPCO workers who are in many cases making the ultimate sacrifice by doing whatever they can do. But, like everyone else, my fear is- what if it’s not enough? The usual fail-safes seem to have failed and the innovative alternatives, such as the sea-water with boric acid, is an untested alternative to the usual, powered cooling, plus the power to do so is apparently lacking, with insufficient pumps for all the reactors and one of them actually containing MOX fuel, which mixes the more deadly plutonium with the uranium. So I hope everything will be okay. We are in an unprecedented situation and everyone involved in sear and rescue or trying to tame the reactors is doing an amazing job. Yet the sheer risk remains and some governments are advising their nationals not just to not travel to this region, but not even to stay here. Companies are moving their staff further south where possible. A telling development was the fact that a US aircraft carrier moved itself further from the coast when it detected too-high levels of radiation from a plume emitted from one of the various hydrogen explosions. Friends are talking of going to other areas of Jndsapan for a while, something I’d contemplate, except for the fact that I have a plane to catch a few days from now and want to remain in decent reach from the airport. Plus I am comfortable and ready to be where I am. I don’t honestly know how high the risk of fallout is, but I understand that rain would be most dangerous and just limiting how often I am outside over the next few days would help. I just hope the next few days and beyond re navigated safely, by me and the wonderful people around me, by Japan and even by the world, as presumably a radioactive plume could go wherever the wind would blow it. Not only that, but any serious interruption to Tokyo’s functioning would have difficult effects on Japan as a whole, as it’s by far the economic heart of these islands, financing the rescue operations going on elsewhere. It’s hard to believe how overwhelmed Japan is by all these current and potential calamities. Yet it’s amazing to see how well they are being born, not just stoically, but calmly and generally in good humour. Everything you see destroyed today will be just as quickly rebuilt tomorrow, without even a hint of complaint. I just hope the safety features of reactors and sea defences (such as access to high ground) are improved, and if this means listening to the critical comments of whistle-blowing workers, so be it. Safety is just as important as prosperity- in fact the two intimately depend on one another. No sooner had I started sorting through my many photos from a wonderful day at the ume festival at Kaira-koen in Mito, then my ‘mansion’ (concrete-based apartment) started violently shaking back and forth. Recalling a voice in my dream that morning reminding me to stay calm but alert, I quickly saved what I was doing and turned off the computer and hard drive. I’d experienced many Earthquakes in my time in Japan, but nothing this strong. The building I am in is pretty solid, so I decided it beat to stay inside it and I frantically secured some of my things that looked like they could fall over, while what seemed to be my mobile rang, though I was unable to answer it (I later found out it was Yuko calling my home phone, though in the confusion I forgot I even have one, I use it so rarely these days). In the living room, I turned on the telly and saw an emergency broadcast, showing a map of Japan and red, orange or yellow lines around the coastline to show the severity of Tsunami warnings.There are so many earthquakes here that even though this was bigger than normal, it was only then that I realised something more serious was afoot. Like something out of a very well-made disaster movie, images came on of a tremendous waves approaching the coast, washing over farmland as if it was a sandy beach.Reaching down for my iPhone, i realised there was no reception- whether the transmitters had fallen down or the network was overwhelmed, I still don’t know. Thankfully, my internet was working fine and I was able to email Yuko and get back to messages from friends and family. We set up a plan to Skype and after I’d gone around checking for damage, which was thankfully non-existant, aside from a chip in my sink where something heavy fell on it, we were able to see each other and check everything is okay. Then, later a call came through from my mum and then my dad and I was able to reassure them, in person, not to mention all the messages being exchanged on Facebook, which had I only had phone access would have been impossible and kept them worrying, as even though I am far from the epicenter or Tsunami, only by hearing from me could they know everything is okay for sure. Watching reports come in, what first looked like just large waves proved to be bringers of colossal damage. Cars were being tossed around like toys, people were waiting atop buildings for rescue. In some terrible scenes you could see the driver sitting there in their car, just hoping it would land up somewhere dry enough to get out. Seeing such means of convenience and comfort pushed to their limit was heartbreaking and I can only hope the people I saw there are okay. The after-effects are far from over, with new after-shocks and Tsunamis possible at any time, not to mention the dangers of radioactive leakage from power plants whose cooling systems lack the power to function effectively, even as I speak there is a reactor core in the process of melting in Fukushima. Fortunately, the people are great, helping one another and doing what is needed without complaint.Even around here, I have to admire the people carrying on doing their jobs with so much consideration; convenie staff making sure there’s food, train workers making sure people are safe. Seeing the news the scale of this disaster is wider than anything I could have imagined. We just have to hope and pray for everyone caught up in the path of this.